Mo battled hard the entire race to finally get a shot at Connor, who had controlled the tempo from the first buoy to the final lap of the gold medal decider along with defending champ Casper Steinfath, in the final 50 metres of this frantic and fast-paced affair. It had looked like a fight for gold between Connor and Casper all the way, but Mo first leapfrogged Casper after surging to the shore on a bump that wasn’t even a bump, before narrowly out-sprinting his close mate Connor up the beach to the line to the roars of the large crowd. 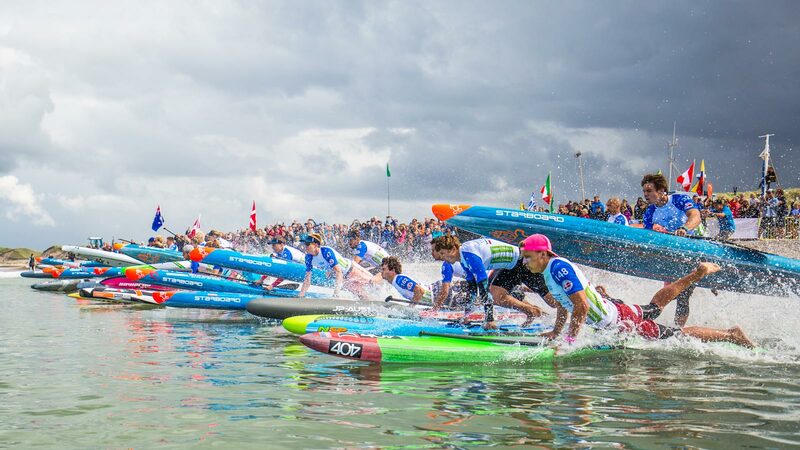 The finish was so tight that nobody – not the commentators, not the crowd, not those of us who were standing right there, not even the paddlers themselves – knew who’d actually won until the finish line footage was analysed by race officials. Mo dropped to his knees in tears when the beach announcer finally announced that he’d won gold, before being mobbed by his Hawaiian team mates for the start of what will surely be a long celebration. Twenty minutes earlier, it was a hectic start to what was always going to be an intense race. After you could have cut the tension surrounding the starting area with a knife in the minutes leading up to the horn, the 30-strong field sprinted off the line as if this were a 200 metre event. After taking off like an absolute rocket, Casper hit the golden buoy in first place to setup a possible fairy-tale finish for the home nation. 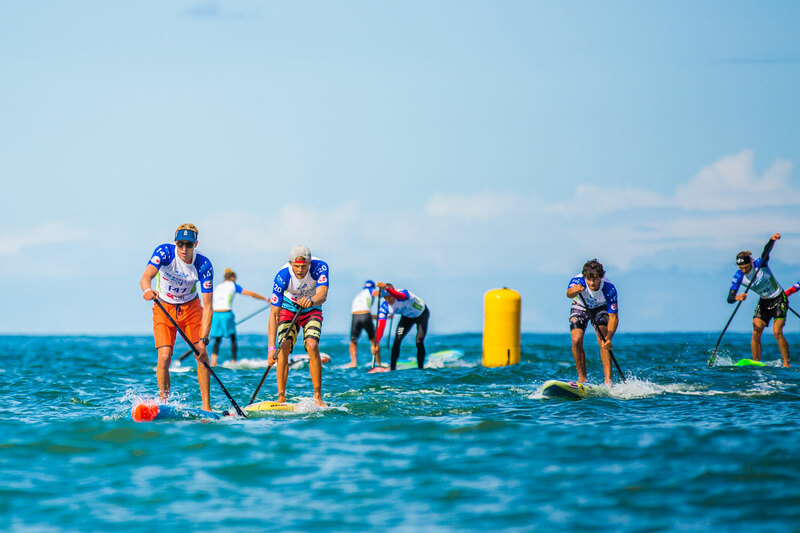 But Connor never let the Viking get more than a board length in front, and by the start of the second lap it was the Hawaiian who was setting the pace out front. Lincoln Dews from Team Australia, one of this season’s in-form paddlers and our official gold medal prediction, was always in the mix but could never get around the lead trio of Connor, Casper and Mo to get his own clean water. After being forced to sit at the back of the four-man breakaway over the opening two laps of this four-lap course, the Aussie’s fortunes received a further setback when he tangled with Mo at the buoy and went for a swim. As the field began to spread out and snake its way around the course, the big movers were the Hasulyo brothers Bruno and Daniel. After their heroics for Team Hungary in the marathon race last weekend, not many pundits had given these boys a shot against the short course superstars. But the bros worked together and set an incredible pace along the back straight to drop the rest of the contenders and keep the leaders in sight. At the same time, the French duo of Arthur Arutkin and Titouan Puyo were left battling in the lower reaches of the top 10 after both of them, Arthur in particular, had a slow start that held them back from the medals we all know they have the talent to win. Titou’s silky smooth skills were enough to hold him in 7th place by the end of the race, however I know these guys will be disappointed that they didn’t finish in the medals. Others setting a good early pace were Team USA’s Giorgio Gomez and Noa Hopper, who were top five early but couldn’t keep pace with the leaders to finish just outside the top 10, and Paul Lenfant the ultra dark horse from Poland, who almost stole the golden buoy money shot from Casper but fell off on the way around and never recovered. Paolo Marconi was another who looked good early, with the Italian able to hold his pace well throughout the race to secure a prestigious top 10 finish in what was the most competitive men’s field the Worlds has ever seen (45.5% on the Race Index). Ollie is just 17 years of age and seems to have the talent and work ethic to be a future champ. Back at the front of the field, Connor, Casper and Mo started the final lap neck and neck, while Bruno, who had run through each of the lap-splitting beach chicanes like a man possessed, was only a handful of board lengths further adrift. As the race reached its crescendo, it seemed as if Connor – who had led from the start of the second lap right through to the closing stages of the fourth and final loop – would be able to hold off the home nation hero and his Hawaiian team mate, but nobody could have predicted what would happen in the final seconds of the contest. First, Connor surged forward as the trio headed towards the beach. As the Hawaiian accelerated, Casper tried to stick on the leader’s tail rather than take his own line — the reigning champ told me post-race that this was a mistake, and that it probably cost him a shot at challenging for the gold in the final metres. But just as Connor seemed to be heading for gold, Mo came out of seemingly nowhere and surged forward with cat-like reflexes after catching a tiny bump that wouldn’t even qualify as a wave. The slight momentum from this micro-swell propelled Mo forward towards the beach, allowing him to first pass Casper and then pull alongside Connor before leaping off onto the sand with the slightest of leads. 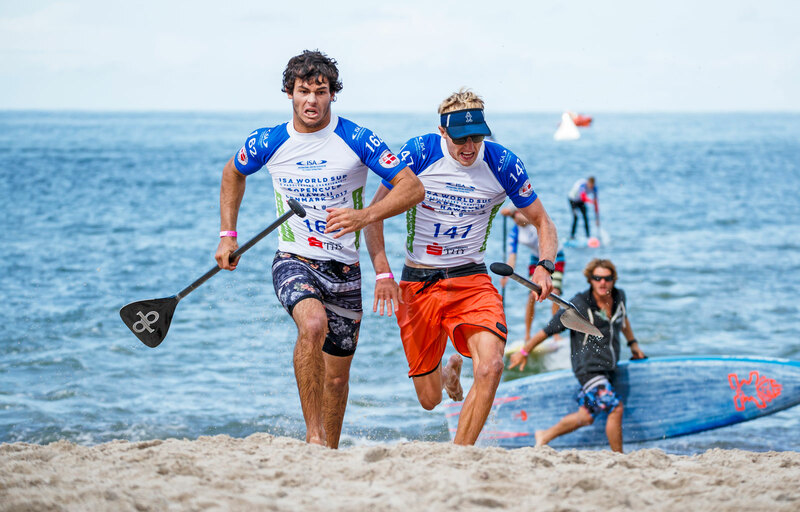 From there, it was a dizzying sprint over the final 20 metres up the beach, with the team mates and good mates shoulder-to-shoulder as they crossed the line. In the end, Mo’s time was officially two-tenths of a second faster than Connor’s, though considering manual timing was being used I daresay the real margin was even narrower. There were countless great performances today. Too many to mention right here right now, but we’ll have plenty more coverage in the coming days (like surfing world champ Caio Vaz pulling out a sneaky top 20 result). So congratulations to all 30 athletes that simply made the final. That was intense. Maybe I’m just caught up in the emotion of the moment, but was that the most exciting beach race we’ve ever seen? And there weren’t even any waves. 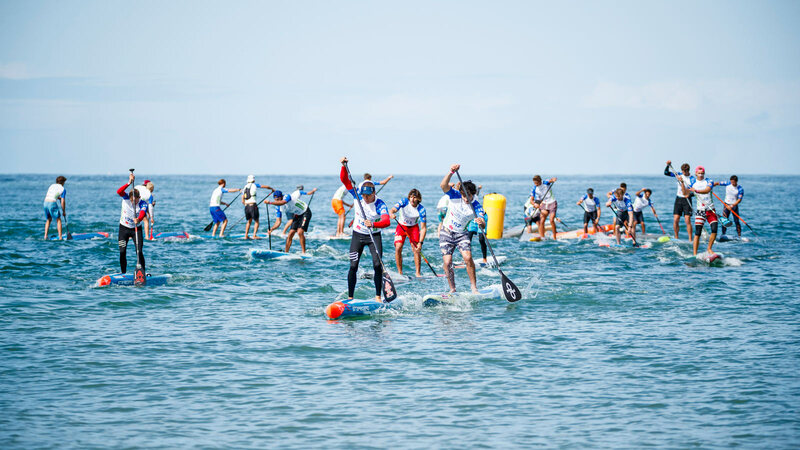 Just imagine… But even without the waves, the event proved that SUP racing can be exciting in relatively flat conditions. So thanks for the great show, boys, that was one hell of a race to watch up close. The proud and spirited Hawaiians have earned another incredible gold-silver finish to match Connor & Mo’s heroics in this same race two years ago in Mexico. It won’t be enough to push them into the top three on the team standings, but they are looking good to hold off Team USA in the fight for the fourth and final spot on the teams podium. It seems like Australia will have earned enough points from their five golds (4x in prone plus Shak’s masterclass in the surfing) to keep the French at bay for another year at least, with Les Bleus needing a miracle in Sunday’s team relay to have any chance of closing the 328 point gap (12001 vs 11673). New Zealand has a lock on third and is an outside chance of reeling in the Frenchies on Sunday morning (the Kiwis are currently on 11338 points). 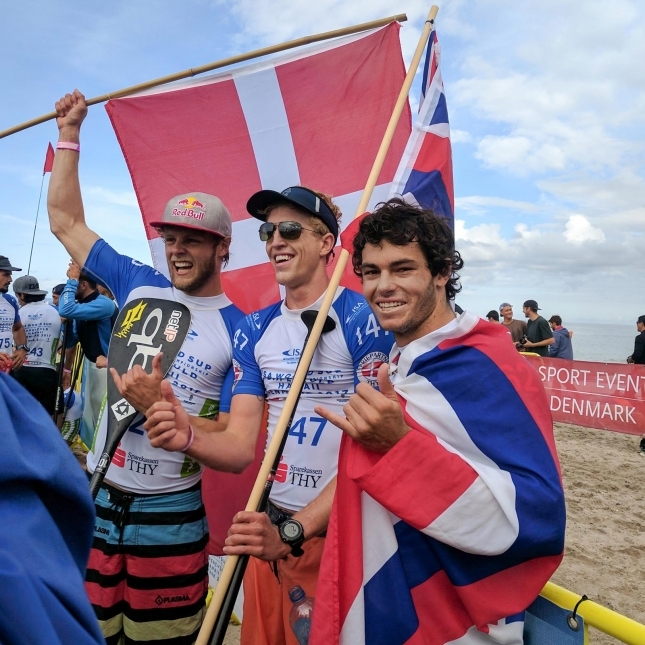 The team relay, which will close out the 2017 ISA Worlds, is scheduled for 9am local time on Sunday (Google “What’s the time in Denmark right now?” to calibrate your own time zone). As always, you can watch the ISA live stream right here on SUP Racer or on the official event site.